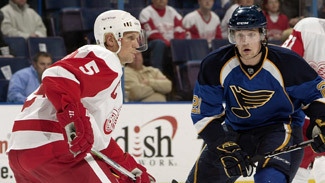 Eighteen years may separate Patrik Berglund, 21, and Nicklas Lidstrom, 39, but the Blues center and the Red Wings legendary defenseman have had one common link since Berglund was barely able to hold his head upright. Just three months after Patrik was born in June 1988, Lidstrom, then a slinky, tall and quiet defenseman, joined the Vasteras Hockey Klubb and became teammates with Anders Berglund, a well-known veteran forward who just happens to be Patrik's father. Anders and Lidstrom were teammates for three years. All Patrik remembers is being the annoying young toddler who ran around the locker room, but Anders remembers the younger version of Lidstrom well. "When he came he was very quiet, but he let his game show the rest of us what kind of a player he was," Anders told NHL.com. "He was rather thin at that time, but I think he was only 19. Still, I mean, he grabbed it from the start and was one of our leading defensemen in his first year. He has always been very intelligent and very, very soon we realized that he was a little bit smarter than the rest of the players." Anders and Lidstrom teamed up on the Vasteras' power play. The elder Berglund said it was one of the more potent power plays in the Swedish Elite League because of Lidstrom's brilliant one-timer, which is still baffling NHL goalies today. "He was wonderful to play with," Anders said. "He was very, very easy to play with and he had a great one-timer even then. He made simple first passes. He was very offensive, but just a marvelous skater so he could go back and make the defense work as well. The thing I remember is he was wonderful in the power play. He was great." Anders said nobody back then was predicting the kind of greatness Lidstrom would eventually discover in the NHL. "At that time, the NHL was pretty far away," Anders said. "We had had a couple of players from Sweden in the NHL, but we didn't expect Lidstrom to go to the NHL after just his third year on our team. When his career went forward everybody saw that he could go all the way, but we didn't see it at that time. He was too young and too thin. No one could believe that he would become the world's best defenseman." STOCKHOLM -- Wait a minute, Patrik Berglund wondered, is that my face on all those fliers? Indeed it was. And yes, strange would be the appropriate word to use right now. During a day trip to Stockholm in late July, Berglund, the young St. Louis Blues center who is from nearby Vasteras, also the hometown of Detroit defenseman Nicklas Lidstrom, felt like he was staring into a mirror as he glanced at the advertisements decorating downtown to promote the Compuware NHL Premiere-Stockholm. "I saw my own face on the fliers and (Henrik) Zetterberg as well as Lidstrom," Berglund told NHL.com. "That was a little weird. I didn't know about that. It was fun and a little unreal, kind of hard to believe." While categorizing the Blues' journey to Stockholm as "a business trip," Berglund also admits he's bursting with excitement. It's one thing to realize his dream of playing in the NHL, but playing an NHL game in Sweden is "almost a bigger dream," one that was too farfetched to imagine just a year ago when Berglund was entering his rookie season and getting comfortable in North America. "It's a real big deal for me," said the 21-year-old Swede, who had 21 goals and 26 points as a rookie last season. "You're playing in the NHL and going home to play the Detroit Red Wings, our rivals and the team with all the Swedes. It's just an exciting moment." Anders, Patrik's father and a former teammate of Lidstrom's for Vasteras IK in the Swedish Elite League, had 11 people with him at Friday's game and 22 more, including many business associates, at Saturday's game. Anders saw Patrik play in eight games last season and he was also in Montreal for the YoungStars Game presented by Upper Deck during All-Star Weekend. This experience will easily top those. "Yeah, it's quite emotional, of course," Anders, who is now a sales manager for an office supply company in the Nordic area, told NHL.com. "Actually, when you are a father like me you don't really enjoy it because you are very nervous. You want the kid to have some success and everything, but it's very emotional and I'm of course very proud of him." Patrik played for VIK Vasteras HK in the HockeyAllsvenskan, Sweden's second highest league behind the Swedish Elite League, from 2005-08. He remembers only one time playing at Ericsson Globe, but it was a national team game and he didn't recall the details. In fact, Stockholm, even though it's only an hour drive east from Vasteras, is not a city he knows all too well. He said if his teammates were looking for a tour guide, they might have to look elsewhere. "Even though I live close, my hometown is pretty big itself," he said. "I have to be a translator for the guys when they need it but I don't know if I can show them around."